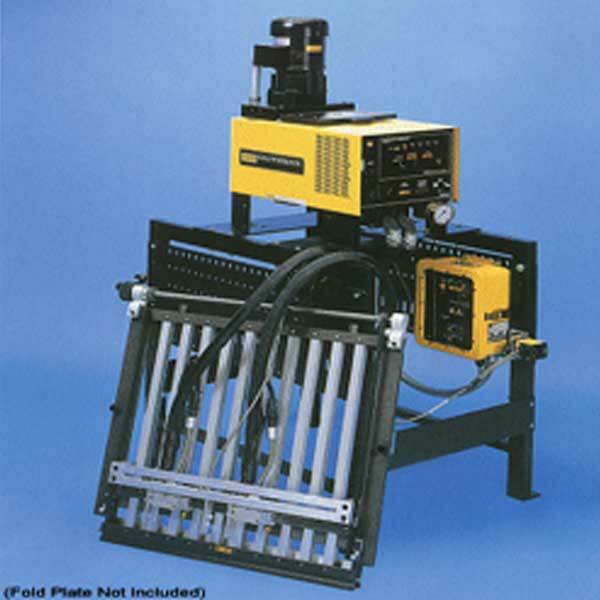 The In-Plate Spot Glue System is configured to meet the precise requirements of commercial folders. Using the universal mounting hardware available, the system easily mounts directly to the crash bars of buckle folder plates of most major manufactures. High Speed Spot Gluing for Mailers - High speed gluing of folded literature demands the utmost precision and reliability. most adhesive sealing systems produce waste during test runs, smear the literature with glue and consume valuable operator time. Other methods require a second operation. The Slautterback In-Plate Spot Gluing System is specifically designed for high speed folding machines to apply hot melt adhesive dots on any folded piece. This reliable, all-electric system places up to six glue dots with a single pass on any fold, including a Z fold. The Astro Packaging system reduces the production time for brochures and mailers by 50% or more. Preset system controls reduce paper waste and eliminate the need for test runs. In approximately 3 ms, the system deposits a minimum 2mm size dot at the same speed of the folder. Two, three or four miniature Slautterback E901 Automatic Applicators are mounted to a dedicated fold plate. The plate inserts into any slot of a folder for spot gluing one-, two- or three-up mailers at a single time. A right angle photoeye is mounted on an E901 bracket support to sense the paper as it approaches the crash bar of the folder. The photoeye causes a controller to signal an electric valve to extrude hot melt adhesive as the paper momentarily stops at the bar. This non-contact method of glue deposition produces cleaner mailers and eliminates glue smearing. The all electric Slautterback KB Melt Unit powers the system. Its unique cylindrical melt tank concentrates heat at the tank bottom, minimizing adhesive degradation and charring. Solid state temperature controllers maintain adhesive temperatures in the melt tank, heated supply hoses and applicators with signal inputs received from RTD sensors located in each heated component. A CH42-S Pattern Controller offers high speed and precision firing of DC-actuated applicators.